Sarah (Happy Designer) is an animal crazy Graphic Designer & Illustrator, with over 12 years of professional experience as an illustrator and designer working with hundreds of clients far and wide! As a branding specialist and Children’s creative illustrator, she has worked with agencies and publishers to develop the knowledge and expertise to be able to give her clients the unique & professional designs they are searching for! I have known Sarah for many years, she was my course tutor when I did my design principles degree module. She is a brilliant teacher and everyone on the course did really well. I really enjoyed it and learned so much about design, how to research and what works and what doesn’t. We were tasked to design an advert for a water company and a magazine spread, the subject of mine was the history of the chocolate Labrador, a subject very dear to my heart! Since then I have built many of Sarah’s web designs, developing them into live WordPress websites from her PSD design compositions. I maintain Sarah’s own websites which include the main one above and Electronix Band. Sarah is one half of Elecronix band with her husband Barry. They are doing brilliantly and have many bookings. 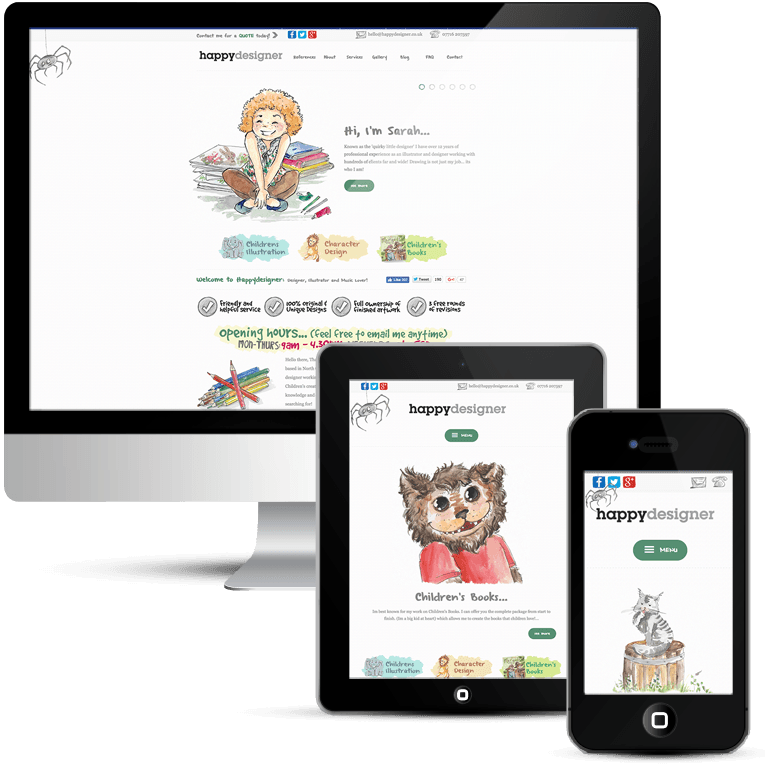 The Happy Designer website was a pretty complex web design to build. There is so much detail and pieces that must sit in exactly the right place to complete the design. It’s a responsive web design, so of course displays beautifully on all devices. A huge challenge but enjoyable and certainly plenty of job satisfaction.